Spaces and Places: Where We Create is now accepting submissions from art therapists, art therapy students, expressive art therapists, and art organizations for this photo documentary project that aims to provide education, awareness, inspiration, and understanding about the spaces & places, settings, populations, and materials that the art therapy community works in and uses within their practice. This collaborative event using social media and digital photo sharing via Facebook, Flickr, and Instagram invites participants to submit a photo or photos of their creative work space and favorite tools of the trade. The project will be accepting submissions until May 31, 2012. When creating my ATCs I reflected on the 6 Degrees of Creativity community as a whole, from each of the wonderful workshops being offered and instructors, the inspiring photos of art, comments, discussions, and overall community, connection, and spirit of creativity. I chose a series of words to describe this experience and included six dots on each ATC to represent the concept of 6 Degrees and how we are all connected through our creativity, as well as having the opportunity to spread this energy and inspiration among ourselves and to others in our personal and professional lives. 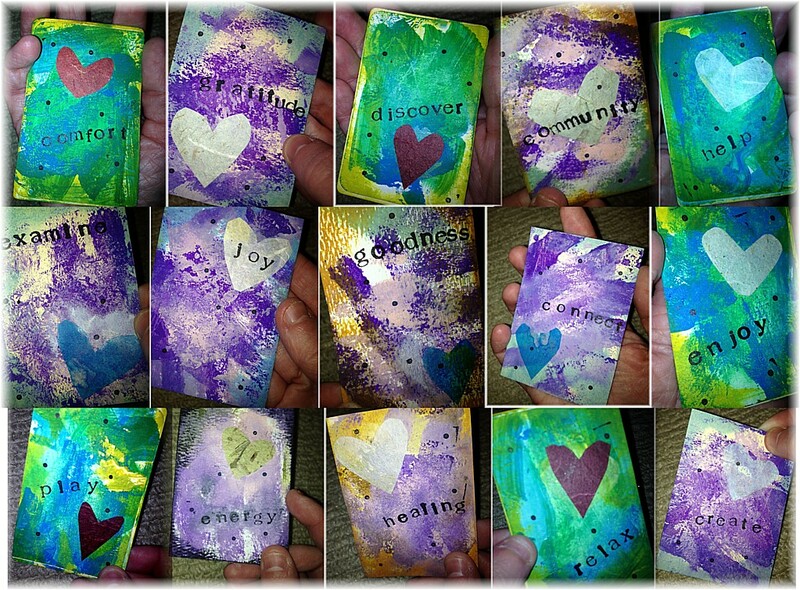 The words highlighted on each of my ATC cards express my collective response I’ve witnessed. It’s been a pleasure to actively engage with so many excited about creating, sharing, and experiencing this joy within this creative community. Creating with an open heart happens at 6 Degrees of Creativity everyday and that is awesome. Lots and lots of creative goodness spreading everywhere… to our friends, colleagues, family, clients and more….And very soon, the sending out of our ATC mail art exchange will create a little more- I can’t wait! I look forward to sharing how the ATC exchange went in a couple of weeks so stay connected for more! 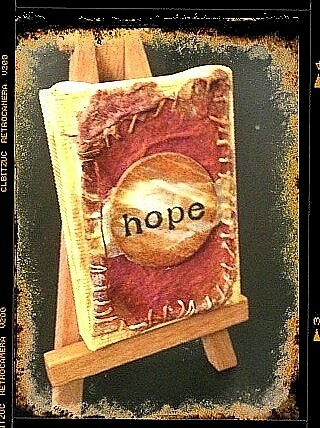 I just finished a mini painting to be donated for the Buckeye Art Therapy Association’s Silent Art Auction during the organization’s 30th Annual Symposium, Resiliency & Empathy: The Art of Healing Trauma being held this week on September 30th and October 1, 2011. All proceeds from this fundraiser will benefit BATA’s Legislative Fund and efforts associated with Senate Bill 205, legislation to license art therapists and the practice of art therapy in the State of Ohio. Check out this article to learn more about the bill and how to help here. I can’t wait to see what other art is donated this year for this important event! If you are attending, don’t forget to bring something to help out the cause! 6 Degrees of Creativity On Sale Now! I am excited to announce that The Art Therapy Alliance’s 6 Degrees of Creativity goes on sale today! Woo hoo! As first introduced in July, 6 Degrees of Creativity is inspired by the “Six Degrees of Separation” concept that each of us, no matter where we live in the world are only about six relationships away from one another, as well as embraces the power of social networking, the arts, and interactive creativity to making a difference through art-making, creative goodness, and community. 6 Degrees of Creativity is a 6 month on-line workshop opening October 10, 2011 and running until March 1, 2012 with 6 different workshops, offered by a group of 6 inspiring instructors from the art therapy community to explore hands-on concepts, art-making, and ideas related to themes about transformation, social change, collaboration, and using art for good. You can now register anytime between today and December 1, 2011 & participate from anywhere in the world, anytime, and on your schedule, whether it is on your laptop, tablet, desktop, or even on the go via your mobile device! This workshop is open to art therapists, artists, creatives, students, and those interested in art-making connected to the workshop’s theme. Workshop content will include PDFs, video tutorials, written instruction, photos, art sharing, and on-line chats that will be available within the 6 Degrees of Creativity community. 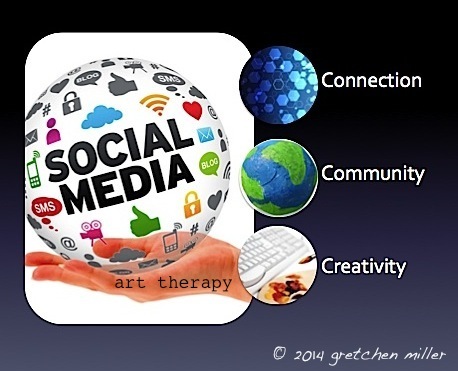 The community’s social networking component will further enhance the sharing of creative goodness among participants, offer opportunities for discussion & idea exchanging, as well as deepen connection through art-making. 6 Degrees of Creativity features a fabulous line up of instructors: Kristina Bell DiTullo, Lani Gerity, Cathy Malchiodi, Jenny Navarro, Katarina Thorsen and yours truly. Only $49 for all 6 workshops! Enjoy! Lots of fun beginning this fall through next spring– Get ready!